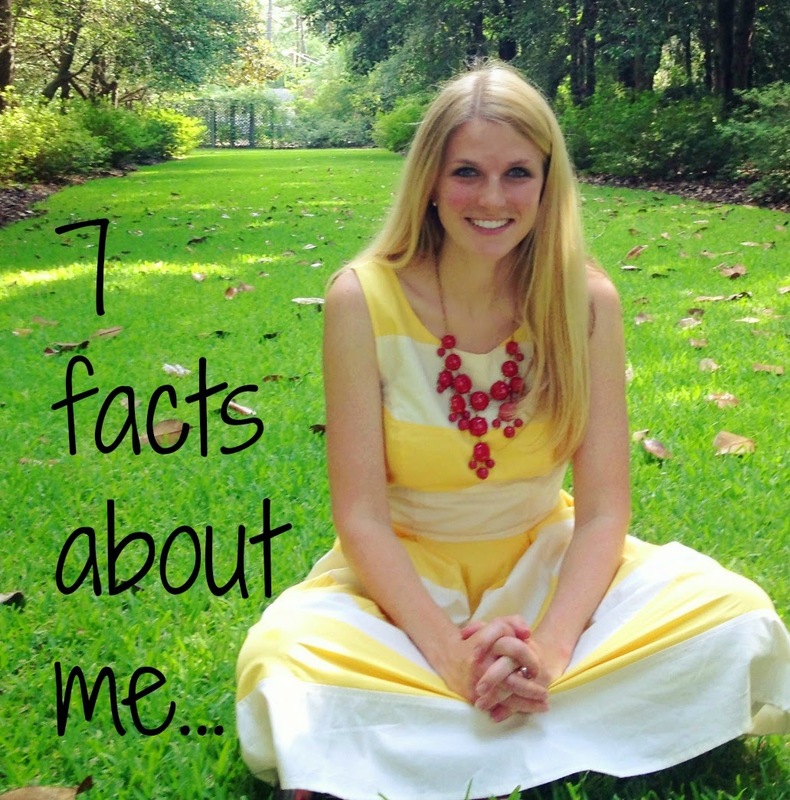 I am very excited because Carolina over at Mama Instincts nominated me to share 7 facts about myself. She has a great blog about natural mommyhood:). It was really fun to read her facts and felt honored when she nominated me, especially when she shared my blog's description. Lately I have been wondering, "do my readers know what this is really all about." when I read her description of my blog I was excited to see that she did, and hopefully others do too. I am a Christ Follower. God has truly changed my life and I hope to share that with everyone I meet. Not in a "I will hit you over the head with my Bible" way, but in love and actions. I am a morning person through and through. And when I say morning person, I mean 3-4 am, some people are still up at night, morning person. I just get better work done in the morning. I used to deny it, but now I embrace it. I have trouble finding balance. Aka, I think I can do it all. But alas, there are only so many hours in the day and at some point you not only have to have priorities, but you have to drop some things. Just because some thing is a "good thing" does not mean you are called to do it! Our family has lived in 5 places in our first 5 1/2 years of marriage! We have been here there and everywhere. We will be moving again soon, hopefully before we enter year number 6. Guess we are averaging out at about a home a year. I am way "crunchier" a mom than I ever thought I would be. Maybe it started with the cloth diapers or the natural birth. We bed shared for quite a while. My daughter is almost 18 months old and still nurses. I am not saying everyone should be like me… there is already way to much judgement and drama in the mama world and every family is different. I am just saying I surprised myself. I love to eat…. just about anything. Sweets, seafood, Mexican, BBQ, I just love food! I like to run, but currently have not been finding the time. I need to work on that! She Lives Free I am not sure how we originally connected, but this blogging friend is all about making a difference. Her post and life share the importance living life to make an impact. She has a great link up called Make a Difference Monday. Our Joy... His Glory Mom to three precious girls and the original creator of the What You Wish Wednesday link up. She is talented, creative and passionate. Fairy Tale Glamorous Sweet new-to-blogging friend with two littles, and still finds the time to share very useful things from creative ideas to teach the kiddos, to how to pack a diaper bag. Nikkis' Nacs Nikki is also a co-host of WYWW. And all I can say is every week I see her meal pal, I just want to go eat at her house! Simply Sweet Melissa Melissa is a currently engaged blogging friend that I can follow along for simple style and life advise! Also a What Wish Wednesday co-host! A+ Life Courtney shares fun and clever things while also being vulnerable and real about her life. I always learn a little something there! Okay… it is y'all turn. Give a shout out to the person that nominated you (aka me:)), share 7 facts and nominate 7 people! 3-4 am. I seriously cringe at the thought. CRINGE. I know, there is something wrong with me right! I genuinely miss you! So glad I can follow your blog so I feel like I don't miss you as much! Love your list and love getting to know you even more!! I am sharing my list on Thursday! Haha… well, I like to get stuff done before the little gets up ( and it just so happens she is an early riser too) and before I head to school! I love this post! It's always interesting to get to "know" a blogger. I was surprised when I became a mom because I had no idea I had all this crunchiness in me. Haha! We definitively have that in common. I feel ya on finding balance. I struggle with it every day and I think most moms do. Having my priorities straight and learning to let go has been a good exercise for me now that I have a toddler to tend to. Caroline, that is a great idea for a post! I am going to have to add that to my drafts and work on it! :) Just visiting your bright corner of the world is encouraging and I love that you gave a shout out to your bloggin friends. Stasia, I really enjoyed reading this; it's so fun to get to know the blogger behind the blog better. Now I just need to have you and your family over for dinner sometime. I'll get my post up soon. I am telling you, I look forward to reading your meal plans every week! Nice to meet you! When you say morning person, you aren't kidding, huh? I'm a night owl, probably because I'm an actress and have late rehearsals. Any tips to being more peppy in the morning? Excited to read your 7! Thanks for sharing a bit about yourself. It was fun to read. I fall under your #5 category too. I think it was because of our first baby. You start to rethink everything you do when it comes to a fresh new life and you want to avoid all fake parts of life for them. I ended up nursing to 21 months! Yes, she stopped "drinking" when she turned 21 :) Thanks for sharing at the Art of Home-Making Mondays this week! That is too funny, BD is almost 18 months and I wonder when she will wean. Guess we shall see! So fun to get to know more about you, Stacia! I love hearing your take on things and it is so fun to "meet" you :) I am right there with you on the Mexican food, although it is a little hard to come by where we live now! And I wish I was able to function that early in the morning- I might get some stuff actually done before my four wake up! We lived in a place where Mexican food was hard to come by for a few years and it was sad! And I think that is part of the reason I get up so early… beat the little up!